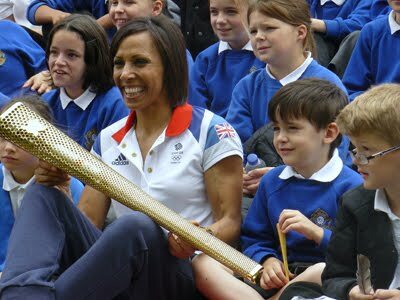 This photo of athlete Dame Kelly Holmes holding the Olympic Flame was sent to me by Heather Wood, a hypnotherapist who lives in Tonbridge, in Kent. The Olympic Flame came to Tonbridge a few days ago and all the schools in the area were invited to send a group of pupils to be photographed with it on Castle Lawn, at Tonbridge Castle. Dame Kelly Holmes is a retired British athlete. She specialised in the 800 metres and 1,500 metres events and won a gold medal for both distances at the 2004 Summer Olympics in Athens. The Olympic Flame was a symbol of the Olympic Games in ancient Greece. The Flame commemorates the theft of fire from the Greek god Zeus by the hero Prometheus, who gave it to mankind so that civilisation could develop. The fire was reintroduced at the 1928 Summer Olympics in Amsterdam, and it has been part of the modern Olympic Games ever since.